Known for her grace, strength, and Olympic prowess. Nastia Liukin is one of the greatest gymnasts of our era. However, it took courage and perseverance for her to achieve that title. October 30th of 1989, in Moscow, Russia, Soviet Union, Anastasia Valeryevna “Nastia” Liukin was born to previous soviet champion gymnasts Valeri Liukin and Anna Kotchneva. After the collapse of the Soviet Union, Nastia and her family left Russia behind and moved to the United States when Liukin was at the age of two. Once in the states Nastia’s father Valeri Liukin and his former competitor teamed up and open World Olympic Gymnastics Academy in Plano, Texas. Here is where Nastia got her start and cultivated her skills in gymnastics. From the age of three, she spent most of her time in her parent’s gym. And though her parents were world-class gymnasts in the 80’s, they did not want their daughter to follow in their footsteps. However, Nastia’s natural aptitude for gymnastics soon led them to change their mind. In 2002, Liukin competed for the first time at the National Championships at the age of 12. At this event, Liukin suffered a fall from the uneven bars. While other members of her team scored high for the event, Liukin placed 15th, however, it was still high enough to get her a place on the US National Team. She was chosen to compete at the Junior Pan American Championship in 2002 with the US Team and here is where Nastia contributed to her team winning gold. Liukin placed second on the all-around, uneven bars, and balance beam. From there Nastia only got better, winning gold in the junior division of the 2003 US National Championship for three events out of the four that she competed in. Liukin accomplished the same feat in 2004 for the National Championship. Liukin was also able to win gold at the 2003 Pan Am Games and at the Pacific Alliance Championships. Liukin has had Olympic aspirations since 2004. However, she was 10 months too young to qualify for the spot on the senior team. However, with Liukin’s talents and her scores, had she been 10 months older she would have been a no-brainer for the Olympic Team. But since that wasn’t the case, Liukin would have to wait another 4 years to compete in the 2008 Olympics in Beijing. In the meantime, Liukin won championship after championship throughout 2005 and 2006. She seemed to be on a bright path, she even qualified for the US Team again for the 2006 World Gymnastics Championships, however, an injury to Liukin’s ankle kept her from competing in all the events except one. Liukin obliterated the competition with her uneven bar routine and scored the highest for that event in the meet. Her efforts helped the US Team win silver. In 2007 Liukin underwent surgery to for her ankle, and the recovery time kept her from competing for most of the year. She returned to make an appearance at the Pan Am Games despite still being in recovery. However, the US team won gold, and Liukin brought home two silver medals one for the uneven bars and displaying why it’s so important to practice with balance beams by bringing home her second silver medal. By 2008 the buzz about Nastia Liukin was everywhere. She continued to compete placing high at many of her gymnastics meets. She was eventually invited to compete in the US Olympic Trials where she earned her spot on the team for Beijing. Liukin’s clean routines and precision in three of her four events led her to win the Gold medal in her all-around. She won several other silver medals in the competition and became tied with other past Olympians to when the most medals in a single Olympic game. Though her success at the Beijing Olympic games earned Liukin tons of press and international recognition. In 2009, Nastia showed up at the CoverGirl Classics and made her first post-Olympics appearance. She finished 4th in the competition, however, when given the chance to compete at Worlds, she pulled out claiming that she didn’t feel like she was up to World Championships standards. After a 3-year hiatus from Liukin, in 2012 she spent several months training and petitioned for a spot on the Visa National Championships. She scored high enough to qualify for the event and was eventually chosen for the Olympic Trials. However, after her fall from the uneven bars during the event and low scores, Liukin’s gymnastics career ended once the event was over. 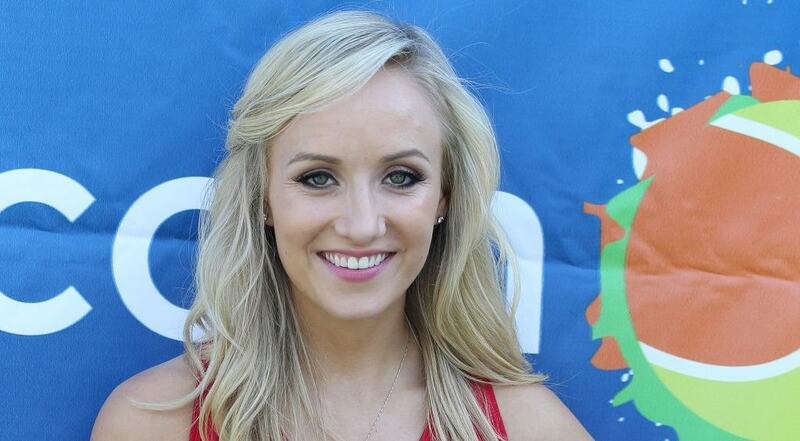 Now Nastia Liukin is living the life of a young adult. She’s engaged to be married and devoting her time to fitness, mentoring aspiring gymnasts, and fashion. Liukin’s dedication to the sport of gymnastics shows just how much practicing and persevering will pay off. So, learn more about gymnastics equipment for kids if you believe your child has an aptitude for the sport. Photos from: zhukovsky / depositphotos.com, Jean_Nelson / depositphotos.com.